In honor of national cookie day (best holiday ever), I am sharing the recipe from my cookbook for Fluffly Cracker Cookies. What's a FCC you ask? It's an addicting, sweet, salty, guilty pleasure concoction that is insanely easy to make. 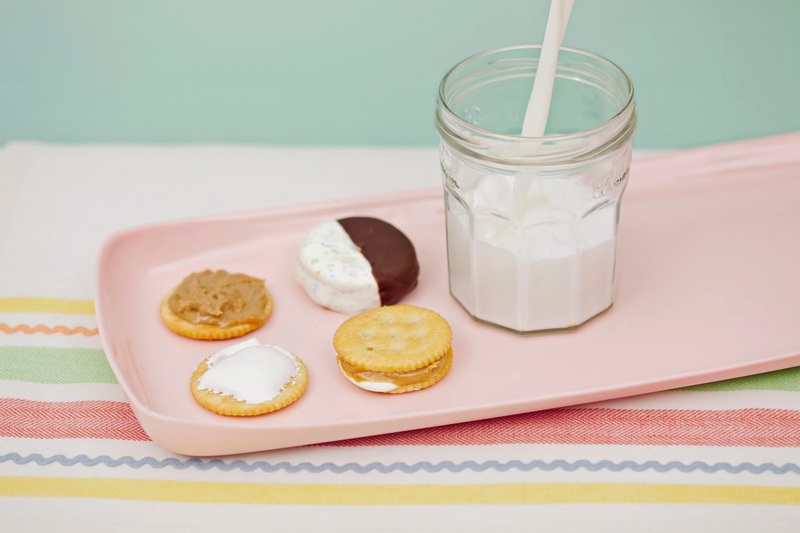 It uses fluff, peanut butter, crackers and chocolate to make a cookie. That's about all I have to say. Place all 40 crackers on the prepared cookie sheet flat side up. Spread peanut butter on 20 crackers and fluff on 20 crackers. Place the crackers with the fluff on top of those with the peanut butter, making 20 peanut butter–fluff sandwiches. Melt and temper the milk chocolate (or melt Wilton Candy Melts). Dip half of each sandwich into the milk chocolate and return to the wax paper. Refrigerate for 45 minutes, or until firm. Melt and temper the white chocolate (or melt Wilton Candy Melts). Dip the other half of each sandwich into the white chocolate and return to the wax paper. Refrigerate for 45 minutes, or until firm.